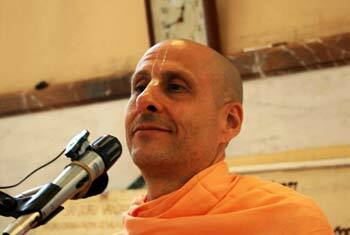 Question to Radhanath Swami: Swamiji, what is your definition of God? Is God the manifestation of our own superior self, or do you see him as a distinct entity? Radhanath Swami Answers: In the Brahma Sutra, which is the summary, essence of the Vedas, Upanishads, Samhitas and Puranas, it describes at the very beginning the definition of ‘God’. Janmady asya yatah: God is the source of everything, from whom everything emanates. The Vedic literature compares God to the sun. Sun planet is the source of all light and all heat, and nothing can live without it. The sun rays are absolutely non-different from the sun, in quality; they give off heat, they give off light, and they are of the same substance. And every sun ray is coming from the same source; so they are all related, they are all united. But quantitatively, there is difference between a sun ray and the sun planet, because the sun planet is not coming from the sun ray, rather the sun ray is coming from the sun planet. Similarly, the Upanishads explain nityo nityanaam cetanas cetananam, there is one Supreme Truth God – who is like the sun – from whom everything emanates, and there are limitless eternal truths – like the sun rays. Wherever there is life, there is part of God. So in the bhakti tradition, we are all like those sun rays. We are sat-chit-anand; just like God, we are eternal, full of knowledge, full of bliss. What is that bliss? The potency to love with compassion. We are beyond birth and death, that’s the nature of the soul. But there are many of us, and we are all connected in our appreciation that we are coming from the same source, who we call Krishna. So Krishna is the supreme object of love and we have the supreme power to love and to feel loved. The Bhagavat Purana tells, brahmeti paramatmeti bhagavan iti shabdyate. There are 3 principle aspects of that one truth revealed throughout history in all the great scriptures: Brahman, all pervading presence of God, Paramatma, the God who is personally within everyone’s heart as the witness and our constant friend if we just turn to him, and there is Bhagavan who is the supreme all attractive unlimitedly beautiful loving God; we call him Krishna. In certain traditions people aspire to enter into the atmosphere of that unlimited aspect of God, some yogis try to connect with that Lord within their heart, and the bhaktas want to completely offer our love to the supreme, all attractive, all beautiful person of God. 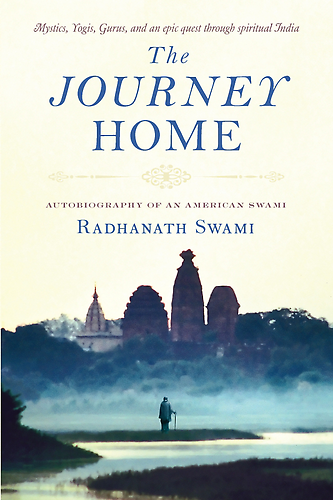 And this is one of the things that convinced me to follow this path of bhakti, because I found in it, not just a sentimental idea, but a really deep understanding of the unity of all religions, even in their apparent contradictions.